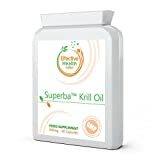 • Effective Health Nutrition Superba Krill Oil provides a potent anti-oxidant packed with Omega-3 Fatty Acids – 48 x more potent than omega oils. • The Omega-3 in Krill Oil has been shown in numerous clinical studies to improve your cells’ response to insulin, neurotransmitters and they reduce your risk of heart disease, stroke, Alzheimers, arthritis and a host of other autoimmune diseases. • Krill Oil Omega-3s are identical to the lipids in the human cell membrane, whereas fish oils are not. Fish oil needs to be made into phospholipids by the liver. This conversion process is inefficient and means that Krill Oil phospholipid omega 3s are absorbed by the body’s cells 60% more efficiently compared to other marine sources. The main way Omega-3 works is by reducing inflammation throughout the body. • Effective Health Nutrition Superba Krill Oil uses only endorsed eco-harvesting methods which result in minimal environmental impact. The innovative and sustainable krill harvesting processes will ensure future generations can benefit from this incredible nutrition-packed resource. • Effective Health Nutrition Krill Oil Capsules are manufactured in the UK to GMP code of practice. Only the finest quality raw materials in their highest and purest form are used. These manufacturing procedures ensure that the basic manufacturing practices and prerequisites necessary for product quality and safety are being followed. This goes above and beyond what is required so that we can guarantee you receive consistently high quality products. You probably know that antioxidants are your body’s #1 way to neutralise health-damaging free radicals. The unique and synergistic blend of ingredients in genuine Superba Krill isn’t found in fish oil or anywhere else in nature. Krill are at the bottom of the food chain, they are virtually free from pollution and contamination. Krill oil contains both antioxidants and omega-3s. With the many benefits and the solid research behind it, the list of how Superba Krill Oil can support you will likely impress you. Many of the potential benefits of Superba Krill Oil are listed below: • Supports a healthy heart • Helps maintain blood sugar levels already in the normal range • Supports healthy joints and overall joint comfort • Supports a healthy brain and nervous system function and development • Helps maintain cholesterol levels already in the normal range • Supports your immune system • Supports a healthy mood Unlike other fish oils, Antarctic krill oil carries omega-3s in the form of phospholipids – liposomes or little packages that deliver the fatty acids directly to your body’s cells. Scientific evidence to date has shown that the safest and most effective carriers of EPA and DHA are these phospholipids. Unfortunately, standard fish oils lack this phospholipid complex. Instead, they contain omega-3 fatty acids in the less-beneficial form of free triglycerides. Why are they so important? They: • Provide the building blocks for your cell membranes • Regulate cellular transport by functioning as “gate-keepers” • Help protect your cell membranes from free radicals This unique relationship between the phospholipids and omega-3 fatty acids greatly facilitates the passage of the fatty acid molecules through your intestinal wall. * This helps you in three ways: • Makes the omega-3 fats in Superba Krill Oil more bioavailable than those in fish oil • Allows EPA and DHA to directly enter your cells • Improves your omega-3 to omega-6 ratio.